The year 2016 was amazing for Girls With Ideas. We founded our business, wrote and tested our curriculum, had a successful Kickstarter campaign, completed the Iowa Startup Accelerator, and now are selling and shipping our products. Thank you for your support helping us start and grow! To end the year, we collected a bunch of stories about girls making a difference in 2016. As a team fighting for gender equity, it can be difficult to feel like progress is being made—but it IS happening! Here are ten of our favorite stories about girls with ideas making world-changing differences in the world. In January 2016, we learned about Marley Dias. Marley was tired of reading books that did not have any characters that she could relate to, so she decided to do something about it. At age 11, Marley started a book drive to collect books about black girls like her to donate to kids in Jamaica. Her social media campaign uses the hashtag #1000BlackGirlBooks and you can learn more about her idea here. 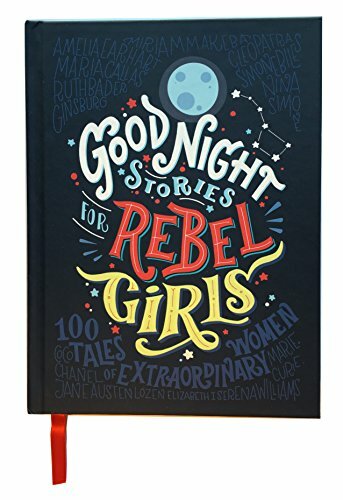 In spring of 2016, Good Night Stories for Rebel Girls launched on Kickstarter and raised over 1 million dollars in pre-orders, making it the most funded book in crowdfunding history. This children's book has 100 different stories about the life of 100 women that made a difference in the world. Better yet, 60 female artists made all of the illustrations in the book. The first run of books is already sold out, but you can pre-order another copy here or get the Kindle version on Amazon here. We love this book and the fact that so many people support girls standing up for what they believe in! The U.S. women were the biggest winners at the Rio Olympics. Out of 116 U.S. medals, women brought home 61 (men took home 55). If the U.S. women were their own country, they would have tied with Britain for the most medals! The Olympics provided many stories to inspire girl athletes everywhere. Favorites included the story of Simone Biles who won five medals, four of them gold, making her the most decorated U.S. gymnast in a single Olympics. The story of Katie Ledecky inspired many girls as she also brought in five medals, four of them gold and smashed two world records along the way! Sabre Norris made headlines for being the youngest surfer to receive the wildcard to participate in Sydney's International Women's Pro surf competition. Not only is that awesome, she gave an amazing interview on the news where she tried to describe her excitement and share her thoughts (one of those thoughts was that she wanted to spend her prize money on doughnuts). She inspired girls everywhere that age doesn't matter and it is okay to be yourself and say what you feel! TakePart traveled to six different continents to tell the stories of 16 different girls on what it was like for them to be 16-years-old in 2016. This beautiful video series took us into the lives of the 50 million girls around the world. From the story of a Syrian refugee to a fashion designer in England, we learned the issues and stereotypes girls face. We also learned about the things they enjoy and what they have in common with each other even though they live miles apart. You can view the full video series here. Hillary Clinton became the first woman to win the presidential nomination from a major political party. No matter your politics, this was a powerful moment for girls everywhere that Hillary got farther than any other woman in the U.S. at shattering the ultimate glass ceiling. 7. There Were Girl Ghostbusters! 2016 brought us a remarkable remake of Ghostbusters with all women. Little girls everywhere loved the funny and intelligent women superheroes that they could look up to. Three minority women were elected to the Senate in 2016—a new record. While there is still a long way to go to have representation that reflects the American population, these three wins show that we are making progress. Catherine Cortex Masto is a former state attorney general, was elected as a senator representing Nevada. She is the first Latina Senator. Tammy Duckworth was elected to senate to represent Illinois. She is the second Asian-American senator and an Iraq War veteran. She is also the first Thai-American woman in Congress! Kamala Harris was elected to represent California in the senate. She is the second African-American woman to be elected and the first Indian-American senator! Nine-year-old Avery Jackson was the first transgender girl to be on the cover of National Geographic Magazine. The issue is devoted to gender because Susan Goldberg, the magazine's editor in chief, said "It seems that the discussion about gender is really at the center of our national conversation. It is playing out in our education system, legal system, the military." We love this cover and the recognition that conversations around gender are important. And how we could we forget #HotDogPrincess—the girl that wore a hot dog costume to princess day?! She made a statement showing that girls don't need to like or pretend to be princesses, they can be and like whatever they like!